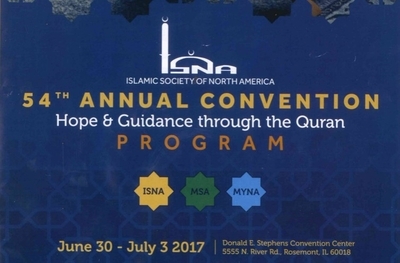 The Islamic Society of North America (ISNA) wants to be viewed as a mainstream Muslim organization, but its recent convention suggests it remains anything but moderate. ISNA's annual convention drew thousands of people in Chicago last weekend, spreading paranoid messages such as claiming President Trump wants to put Muslims in concentration camps, and presenting speakers who cast convicted terrorists as victims. Invoking Japanese internment camps from World War II, speaker Zahra Billoo warned that Muslims face a similar fate despite assurances from politicians today. "And we know from our experience that unless we have laws in place... and we [know they have done this] with other communities, that they're going to send us to concentration camps," she said. Billoo is the Council on American-Islamic Relations' (CAIR) San Francisco director. In the past, she has urged Muslims to "build a wall of resistance" between themselves and law enforcement, equated Americans in the Israeli army with ISIS terrorists, and accused the FBI of fabricating terrorist threats for public consumption. ISNA saw her as an ideal person to lead a political discussion. Joining her was a former CAIR official who used the opportunity to advocate for convicted terrorists, including one whose case has been championed by al-Qaida and ISIS. "...[Some] of them are our leaders," Cyrus McGoldrick said. "Some of them are our youth, who were entrapped, some people were framed, I'm talking about Imam Jamil Al-Amin, I'm talking about Tarek Mehanna, I'm talking about Dr. Aafia Siddiqui. A number, hundreds, hundreds of leaders who, and Muslims who are in prison right now. And we forget them, we forget them. No one's talking about that at this convention. We need to do more." Jamil Al-Amin, a Black Panther formerly known as H. Rap Brown, was convicted in 2002 for killing a Fulton County, Ga., sheriff's deputy who tried to serve an arrest warrant. Tarek Mehanna was convicted in 2011 for conspiring to provide material support for al-Qaida and lying to federal investigators. After traveling to Yemen seeking training in order to then fight U.S. soldiers in Iraq, Mehanna returned to the United States where he posted al-Qaida recruitment videos and other documents online. 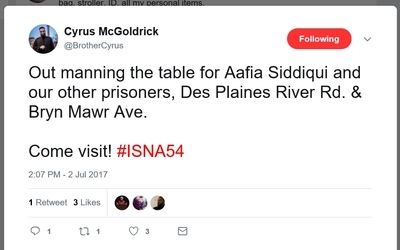 Aafia Siddiqui, an MIT-trained neuroscientist, represents the most extreme case McGoldrick cast as "political prisoners" to his ISNA audience. Afghan security officers detained her in 2008, finding "handwritten notes that referred to a 'mass casualty attack'" and a list of New York landmarks. During subsequent interrogation, Siddiqui, known as "Lady al-Qaida," managed to grab a soldier's M-4 rifle and open fire. She allegedly shouted, "I'm going to kill all you mother**kers!" and "Death to America." Before executing prisoners James Foley, Steven Sotloff and Kayla Mueller, ISIS offered their release in exchange for Siddiqui. 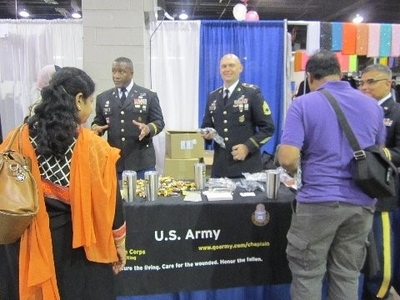 Ironically, U.S. Armed Forces recruiters set up a booth in the exhibit hall not far from where McGoldrick defended convicted terrorists. Despite such rhetoric, ISNA remains politically influential. It played a key role in convincing former FBI Director Robert Mueller to purge FBI training materials dealing with Islam. Former ISNA President Mohamed Magid served on President Obama's Homeland Security Advisory Council. During the Obama administration, ISNA representatives met with then President Obama and Vice President Joe Biden, and ISNA hosted then-DHS Secretary Jeh Johnson at its convention last year. ISNA's congressional allies include people like U.S. Reps. Don Beyer, D-Va.; Keith Ellison, D-Minn.; Andre Carson, D-Ind. ; U.S. Sen. Orrin Hatch, R-Utah and U.S. Sen. Richard Durbin, D-Ill.
"How do you ensure that the public continues to support the War on Terror, which is really a war on Islam and Muslims?" Morrow asked. "By means of terrorist attacks, by means of false flag operations, that way the eternal endless war of the globalist totalitarian fascists continues unabated to the pleasure of big brother, or as we know him in Islam, the one-eyed liar. "The philosophy is clear. Keep the focus on fear." This is the same narrative that ISIS jihadist recruiters use to lure disaffected Muslims into becoming terrorists. Prominent Muslim activist Linda Sarsour falsely asserted that white supremacists were a bigger terror threat in the United States than Muslims. "I will not be on a national platform condemning terrorism as a Muslim. I will only condemn terrorism as a human being because that's the only place that we should be condemning terrorism, because terrorism should never be framed as a conversation that should be just had with Muslims in a country where white supremacists have killed more people since 9/11 than Muslims have," Sarsour said. Even the liberal New America Foundation now admits that Muslim terrorists have killed more Americans since 9/11 than white supremacists. Sarsour accused the Trump administration of being an "authoritarian racist regime" that needed to be resisted. "I hope, that when we stand up to those who oppress our communities, that Allah accepts from us that as a form of jihad," Sarsour said. "That we are struggling against tyrants and rulers, not only abroad in the Middle East or on the other side of the world, but here in these United States of America. "You have fascists and white supremacists and Islamophobes reigning in the White House." The ISNA convention also featured hatred of Israel. Several speakers promoted the Boycott, Divestment and Sanctions movement that aims to isolate Israel. Sarsour proudly proclaimed that the prominence she received due to her involvement in the Women's March in January gave her a better platform to discuss the BDS movement. "I have been able to have our country reckon with this conversation about what does it mean for a Muslim or a Palestinian American to be part of the resistance and to be working with allies who are now taking up the cause of BDS and supporting the Palestinian people," Sarsour said. "So, what I am saying to you is don't be afraid to be the center of controversy." Billoo repeatedly referred to the Jewish state as "apartheid Israel." McGoldrick attacked the Muslim Leadership Institute (MLI), which "invites North American Muslims to explore how Jews understand Judaism, Israel, and Jewish peoplehood." MLI brings people to "occupied Palestine," McGoldrick said, indicating he had no interest in recognizing its legitimacy. He condemned MLI for teaching Muslims about Zionism in a positive manner and for instructing them about Judaism in "so-called Israel." This kind of hateful rhetoric is a staple at ISNA conferences. In 2009, a speaker lamented Jewish "control of the world." In 1993, ISNA signed a declaration calling Israel's creation a crime. "To recognize the legitimacy of that crime is a crime in itself and any agreement which involves such recognition is unjust and untenable. The League of Ulama in Palestine declared on Sept. 14 '93 that no one has the authority to concede the rights of the Islamic Ummah in Palestine." It would seem that ISNA's radical past still is very much part of its radical present. Politicians should think twice before working with ISNA as long it tolerates and gives a platform for narratives that enable terrorist recruiters.